It’s impossible to underestimate the number of booksellers who joined our ranks by virtue of J.K. Rowling’s early spell, lending the ‘scriptbook’, as we discover it to be called, of Harry Potter’s return a deep significance. Our parties at midnight celebrating both the publication of the book and the premiere of the play encapsulated the adoration so many hold for this extraordinary universe, and the phenomenal sales that followed only proved the continuing power of Rowling’s vision. A full nineteen years has passed since the climactic finale of Harry Potter and the Deathly Hallows. Voldemort is a shadow of the past; Harry Potter himself is now a burdened employee at the Ministry of Magic, the wizarding triumphs of his youth seemingly shelved for the demands of family life. Once again, the vaulting arches of Kings Cross become the gateway to wild adventure as young Albus Severus Potter – Harry’s now second son – boards a waiting Hogwarts Express, prepared to fulfil his own destinies. What lies ahead is as much about the past as it is the future; it will be a time of unexpected alliances and the extraordinary lure of potentially changing what has already come to be. Although much-loved comrades will indeed play their part – no Harry Potter tale can possibly be complete without the courage and companionship of Ron and Hermione – this is very much the next extraordinary chapter, a story where the son of the world’s most famous wizard finds both camaraderie and friendship in a most surprising place, the boy Scorpius Malfoy, son of Draco. 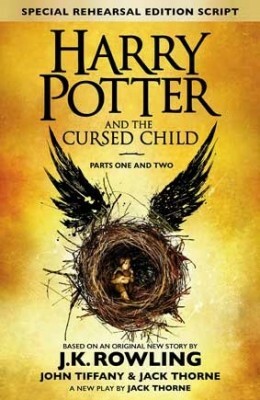 In the pages of Harry Potter and the Cursed Child, one of the very great creations of children’s literature – the incredible world of Harry Potter – lives once again, the unmistakable and authentic voice of J.K. Rowling given sparkling form by writer Jack Thorne’s unmatched understanding of the series. As both companion to the play and as a standalone volume in its own right, the Official Script Book is the ultimate passport of return to the world’s most treasured fictional universe. Find out more about Harry Potter and the singular imagination of J.K. Rowling over on our dedicated Harry Potter page. Having seen Cursed Child, I can honestly say its an incredible story; it tugs on the dragon heart strings. Stupendously brilliant im over the moon.. JK has never let us down and be sure she wont this time with this heart-stopping impressive work of art! !